A powerful, versatile electric cutter with wet cutting kit. Makes it possible to do smaller cutting jobs indoors with a minimum of dust and slurry. By using the wet cutting kit with specially designed nozzles in combination with double insulated rotor and GFCI, (Ground-Fault Circuit Interrupter), combines the advantages of the electric power cutter and an efficient dust suppression. K3000 Wet is the first model with Husqvarna DEX (Dust Extinguisher) system. 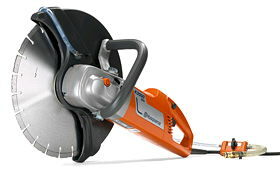 * Please call us with any questions about our concrete saw 14 inch elec. hh in Mason OH, Westchester OH and Cincinnati metro area.